In the basement if its not done properly water issues can cause serious damage and ongoing problems. Its not only important to waterproof but also ensure the ground water behind the walls can flow without restriction and is able to be drained away. Here we have placed strip drain in between the concrete piling, this will create the necessary void and drainage behind the shotcrete walls. 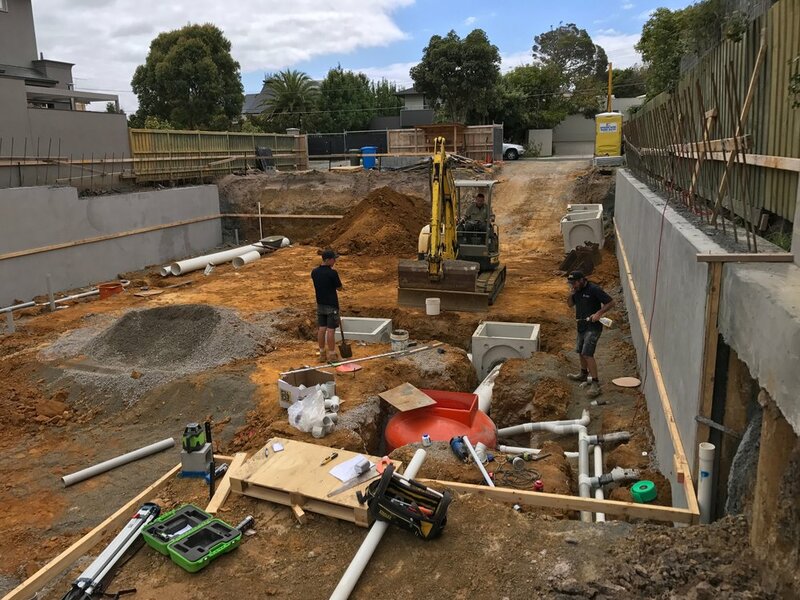 The drainage behind the walls and under the concrete slab need to be linked to a pump station which pumps the water to the legal point of discharge. Above you can see the stormwater pit we also have a sewer pit installed as there is a bathroom and wet bar to be build within the basement. As well as having a large stormwater pit with dual pumps pumping water to the legal point of discharge we have a retention system also designed in the basement for those time when its bucketing down rain and the main drainage system within the street can not keep up with the deluge of water, this allows the water to back up with in the system and not flood onto the basement floor.